When Mulligan says in Telemachus that he and Stephen working together "might do something for the island. 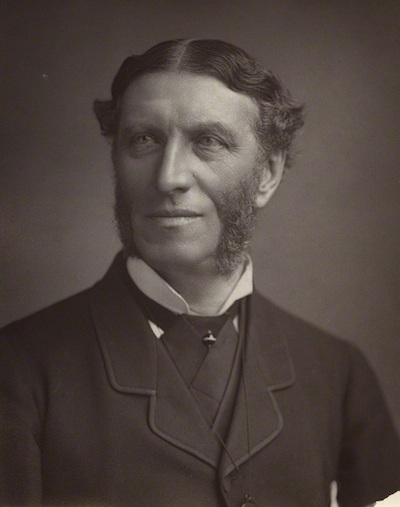 Hellenise it," he is voicing a tenet of late Victorian counterculture advanced by the English poet and man of letters "Matthew Arnold" (1822-1888). Arnold's theory informs statements elsewhere in Ulysses about Greekness and Jewishness. In the essays collected as Culture and Anarchy (1869), Arnold attacked the smug, backward "provinciality" of English culture, which was dominated by well-mannered aristocratic "Barbarians" and even more by morally earnest middle-class "Philistines." In the fourth essay he distinguished the Philistines' impulse of Hebraism (letting the revealed truth of religion guide none's actions) from the intellectual and aesthetic impulse of Hellenism (seeking truth disinterestedly, using human rather than divine guides). Arnold felt that English culture was excessively Hebraic and needed rebalancing. He was agnostic himself, but he admired religious contemporaries like John Henry Newman. By the end of the century, however, Arnold’s language had been subsumed into a black-and-white cultural war between repressive middle-class "philistines" and freedom-loving, artistic "bohemians" (a term that had emerged in Paris in the early 19th century to describe artists). “Greek,” Gifford observes, now connoted bohemian freedom, sensual pleasure, and aesthetic beauty, while “Jew” connoted social repression, “straightlaced Victorian morality,” and hostility to art. Mulligan embodies the decadence of this fin-de-siècle scene, and he shows none of Arnold’s interest in restoring cultural balance. His Hellenism consists of Swinburnean values: flashy style over intellectual substance, hedonism over conventional morality, and atheistic blasphemy over religious piety. In Scylla and Charybdis he praises "The Greek mouth that has never been twisted in prayer." This coincidence of contraries is manifested most obviously in the coming together of the book’s two principal characters. The first chapter identifies Stephen with Hellenism in ways ranging from his "Paris fads" and his “ancient Greek" names to his principled refusal to compromise his intellect for the sake of his mother’s piety. Bloom dresses and acts like a conventional middle-class wage-earner, he becomes identified with the ancient, archetypal figure of the wandering Jew, and his relentlessly practical and moral sensibility contrasts starkly with Stephen’s high intellectual and aesthetic disregard for such things (even though he has, like Stephen, rejected religion). To the extent that some uncanny Father-Son unity is realized between these very different men, jewgreek is indeed greekjew. Despite Arnold's importance in theorizing the union of Hellenic intellectual freedom with Hebraic moral rectitude, Ulysses subjects him to some mockery as a stuffy English gentleman of the previous generation, using the same imagery with which it trivializes "Lawn Tennyson, gentleman poet." When Stephen imagines a scene at Magdalen College, Oxford in Telemachus, he places Arnold there, tending to the prim propriety of the place: "A deaf gardener, aproned, masked with Matthew Arnold's face, pushes his mower on the sombre lawn watching narrowly the dancing motes of grasshalms." In Circe "The Siamese twins, Philip Drunk and Philip Sober, two Oxford dons with lawnmowers, appear in the window embrasure. Both are masked with Matthew Arnold's face." Of these passages Gifford observes that "Arnold's emphasis on restraint, poise, and taste, and on what contemporaries called the 'ethical element' in literature, was regarded as Philistinism incarnate by turn-of-the-century aesthetes, even though many of their terms were derived from Arnold and Arnold's influence was (from an academic point of view) still paramount in English criticism." 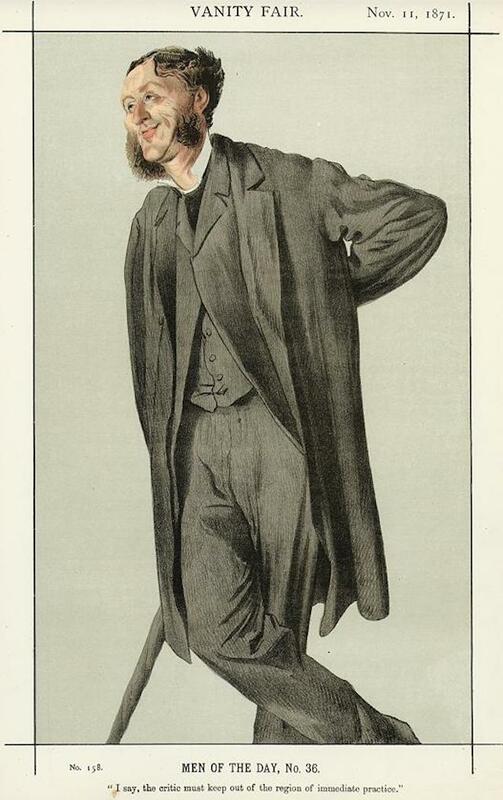 Caricature of Matthew Arnold by Jacques Joseph (James) Tissot, from the 11 November 1871 issue of Vanity Fair. Source: Wikimedia Commons. 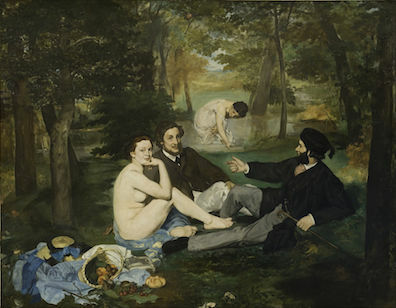 Edouard Manet, Le Déjeuner sur l'herbe, 1863 oil on canvas painting held in the Musée d'Orsay, Paris. Source: Wikimedia Commons. Formal photographic portrait of Arnold by Elliott & Fry ca. 1883, held in the National Portrait Gallery, London. Source: Wikimedia Commons.